Dear Members, Colleagues, and Map Enthusiasts in the Bay Area! I am excited to announce a few changes to the organization that have occurred during this year. The brand mark was inspired by topographic lines, waves, and the Golden Gate Bridge. The name reflects all things geo in the Bay Area and is imbued with a sense of place. The most noticeable change is the organization’s new name, BayGeo (formerly the Bay Area Automated Mapping Association (BAAMA)). The decision to rename the organization was not an easy one and was considered carefully. The Board recognized the legacy BAAMA had created and the deep connection the name has with many individuals as well as municipalities and local companies -- after all, this organization has 30 years under its belt thanks to the strong and committed work of volunteers. BAAMA was one of the founding members of CalGIS - the California state-wide GIS conference. It provided unique opportunities for local industry to meet and collaborate, provided a forum to discuss GIS related technology and policy, has been a great resource for prospective students and employees in the GIS field, and topped off at over one thousand members. What started as a localized and somewhat niche group on mapping technology in the 1980s grew with the expanding GIS market and advent of GIS professionals into the 1990s and 2000s. The past five years have seen an expansion of what it means to be a GIS professional through the maturing of online proprietary and open-source mapping tools (e.g. ArcGIS Online, Mapbox, CartoDB, PostGIS) and the increasing access to geodata (data.gov, OpenStreetMap, etc.) as well as big data. Desktop analysis, managing enterprise geodatabases, and designing map products are still needed, but analytics, web/mobile mapping, and system integrations are now expected. The new form of “geo” involves using Github and working alongside, and collaborating with, developers, data scientists, and designers. This is even more prevalent in the San Francisco Bay Area with local tech companies driving the location-based, analytic, and big data (vector and raster) solutions. To be competitive, GIS professionals need to become full-stack GIS professionals and must network with these communities. That’s not say you need to be an expert, but become familiar with them and make friends in these communities, go to a #geobreakfast or #geobeers, and start scripting. Conversely, this means those communities are now more engaged with geospatial technologies and concepts than ever before. Developers, data scientists, and designers are adding “geo” to their toolbox and are thus becoming “geo-younglings” or “geo-padawans”, if you will. The Board recognized that while GIS concepts have remained the same, the tools, skills, and users are becoming more diverse. We hope the new name reflects this and will resonate with the community. BayGeo envisions a community where cross-pollination of knowledge and ideas is promoted to break silos and better serve clients. On one hand it’s exciting to see other communities using software and techniques traditional GIS users have known about for decades while applying them to new technologies. On the other hand these newly engaged communities still need guidance from GIS and cartography experts to help them navigate the complexity of mapping a sphere -- especially when their mapping needs go beyond points on a map. The concepts of projections, coordinate systems, and datums undoubtedly will make a novice’s head spin. Toss in the basic cartographic principle of classifying quantitative data, the need to normalize, or classification methods, and suddenly the science and breadth of map making begins to expose itself (and I haven’t even mentioned data management/collection, metadata, or colorblind populations). Examples of why the cartographer and GIS professional are needed can be found, unfortunately, everywhere. One can find a good listing of bad maps by searching the Twitter tag #cartofail, xkcd offered up this comic critique of population maps, while local cartographer Stephanie May is working on removing the erroneously used term “heatmap” from mapmaking lexicon (for a good explanation of the word “heatmap” and mapping, read Kenneth Field’s blog post). There is an opportunity for us GIS pros and cartographers to teach, collaborate, and explore new areas with these communities. Our field will grow and diversify through cross-pollination and ultimately everyone will benefit from networking and shared knowledge. This type of interaction is already happening at the larger annual events such as Esri’s DevSummit, State-of-the-Map, and FOSS4GNA. The diverse nature of mapping also means BayGeo must work collaboratively with existing geo groups and affiliates in the Bay Area. This includes the communities mentioned above but also all the peripheral professions that use mapping (e.g. biologists, urban planners, health professionals, law enforcement officers, utility engineers, etc.). To this end BayGeo is also a coalition of groups and organizations that value working together to better serve a complex network of geospatial technology users and map enthusiasts. Current coalition members include GeoMeetup, the Society of Conservation GIS (SCGIS), GIS Education Center, and SF Bay Area GIS User Group. 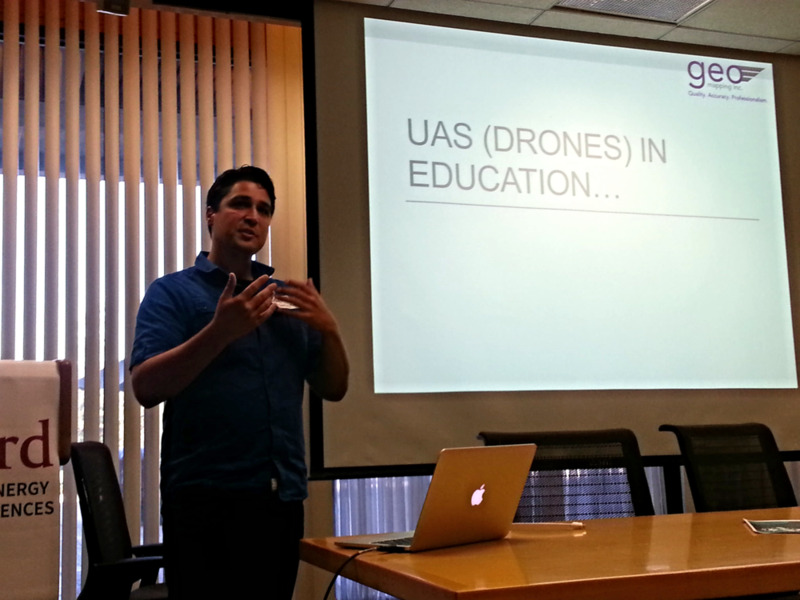 Jeffrey Miller of GeoWing Mapping discusses how drone technology can be introduced into curriculums at the BayGeo Educator GeoSummit in October of 2015. The board has also updated the organization’s mission to: “Lead, Mobilize, and Engage users of geospatial technology and map enthusiasts in the Bay Area.” Our vision is to continue offering year-round discussions and events for GIS professionals and geo-developers through coalition members such as Geomeetup, San Francisco GIS User Group, or South BayGeo. We also support the growing community of the casual mapper -- those who perform mapping as only a small part of their job or passion -- by partnering or creating groups. For example, we have partnered with SCGIS and collaborated on establishing their San Francisco Bay Area Chapter. BayGeo also established the Mapping for Social Justice Workgroup, Open-Data Workgroup, and the Education Workgroup. These are groups where professionals in an "Area Of Interest" are welcome and can gather, learn from each other, and tackle issues and projects through meetings, mapathons, or socials. In addition, there is a tremendous amount of knowledge in the Bay Area to be shared. By working with local colleges, universities and local industry professionals, BayGeo is aiming to make our expertise accessible to existing professionals and those curious about mapping. In October, BayGeo’s new Education Workgroup held an Educator GeoSummit to start building relationships between local educators (K-12 and Higher Education) and industry with Esri, Mapbox, and others participating. Precipitable water data from NOAA mapped by SFSU Geography alum Damon Burgett who currently works for Mapbox. It’s imperative that our local academic programs develop relationships with industry to keep curriculum relevant, bring professionals into the classroom, and to build a talent pool. Tech companies realize they need people with a GIS knowledge-base to build maps and collaborate with other engineers. Companies such as Google and Apple have been plucking students from the San Francisco State University Geography program for their in-house map development. As an example, perhaps you’ve seen Gator alum Damon Burgett's map of precipitable water. Besides having its hands full with uniting the education and industry sectors, the Education workgroup is also preparing to bring back scholarships in 2016. BAAMA did offer scholarships for a few years, and they were highly coveted by local students and novices. This time around we have some wonderful educators volunteering time to build a more sustainable approach that includes both educators and local industry. Look for a scholarship announcement in the first quarter of 2016. We are also finalizing our Code of Conduct policy to ensure all participants feel welcome and have a safe and enjoyable experience. Our field needs more representation from women and minorities. Mapping affects everyone in every walk of life, and we should strive for a diverse community to give everyone a platform to learn, to build relationships, and to share their stories. On a related note, here’s an enjoyable article on the Military Mapping Maidens of WWII. The BayGeo Journal has moved online. After almost ten years of being in PDF format it made more sense economically and distribution-wise. We want to thank Erez Cohen and his team at Mapsense for their support and technical savvy during the move. We feel the design and layout are wonderful for reading on any device and look forward to having community members submit their articles and maps for future issues. I am pleased to announce that BayGeo now has a home in Oakland with GreenInfo Network. Since 1996, GreenInfo has assisted over 800 public interest groups and agencies with mapping, analysis, and other technology projects. We are hugely grateful to Larry Orman and his entire team for welcoming us. We look forward to being inspired by their work and camaraderie. 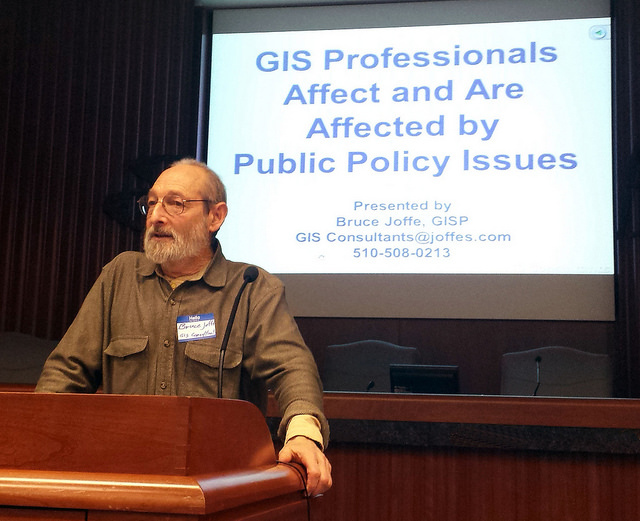 Bruce Joffe at the SF Bay Area GIS User Group Quarterly meeting December 2015. Source: BayGeo Flickr pool. I would like to recognize former board member and Bay Area resident Bruce Joffe who still remains very active in the GIS community. Bruce is the recipient of the 2015 Leadership Award by URISA. Anyone who knows Bruce knows he is deeply invested in the profession and field of GIS. His many contributions and continued work is remarkable. Bruce served on the BAAMA Board for 25 years and we are fortunate to have him as a local resource. Way to go Bruce! I’d like to reflect briefly on 2015 and recognize the work of our staff and volunteers. In the past ten months we have held nearly 20 events, which is amazing, and they couldn’t have happened without people stepping up to volunteer and local organizations providing sponsorship. Our organization relies on volunteers and local partners to make it successful. Please consider giving time, becoming a member, or sponsoring an event in 2016! As we look forward to 2016, BayGeo is poised to help make the Bay Area mapping community stronger and more diverse through our partnerships and outreach. Besides supporting the local mapping community we also wish to lend our support to world-wide projects such as the Missing Maps and FixWikiMap. Working together we can achieve the Digital Earth we envision to help save lives and protect our natural resources. In closing, the board values an organization and community that is inclusive and collaborates with other communities that use geospatial technology. We are proud to showcase our members in local government, academia, private industry, and non-profits. And we are eager to engage developers, data scientists, designers, and anyone else interested in mapping to become a better geo-community. We all benefit from collaborating, networking, and sharing knowledge. I’d now like to leave you with this quote from local geolady, Lyzi Diamond: “Maps are really hard, but that’s not a bad thing. Let's rise to the challenge, learn new tools and technology, and make awesome things.” True that, Lyzi.